College Week and Canadian University Visit! September 14-18 ISD will be celebrating college week! 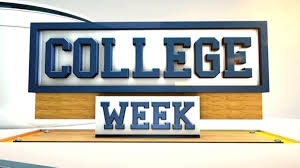 College week is a week dedicated to promoting colleges from around the world. My hope is that it will introduce students to colleges and universities they may not have thought of in the past. They will also be able to use this as a time to learn about college life. This week could not have happened without the collaboration of our teachers and visiting universities. We will also have 3 Canadian Universities on Campus giving presentations on Canadian admissions. There will be a student session on Wednesday during the school day and a parent session on Thursday from 5:30-6:30 in the conference room. I invite anyone interested in learning more about Canadian universities to attend the evening session. I have also attached a Flyer for the Canadian Universities below! The students have received the college week schedule by email, and they will continue to receive daily updates about the university presentations that will happen each day! Feel free to stop by campus and visit the Upper School building. Teachers will have their door decorated with their Alma Mater and will be sporting university gear all week!